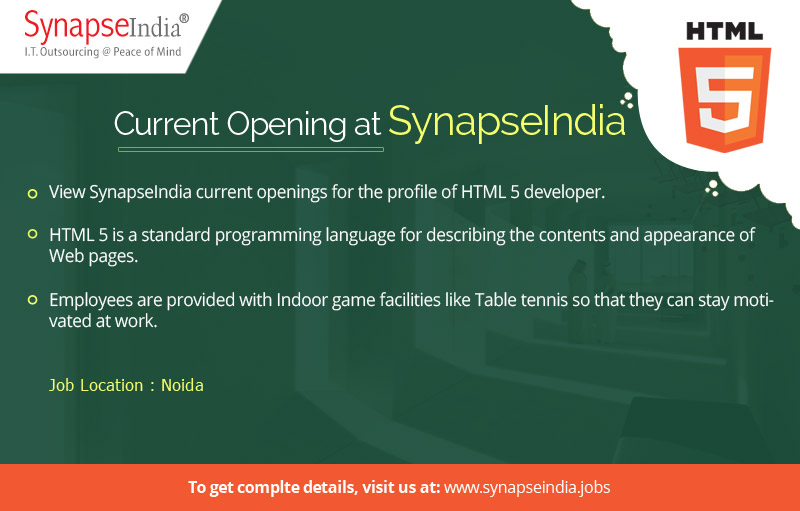 View SynapseIndia current openings for the profile of HTML 5 developer. The job location will be Noida. HTML 5 is a standard programming language for describing the contents and appearance of Web pages. Shamit Khemka founded SynapseIndia in 2000. He is a well known name in the global IT world. Under his guidance, the company has emerged as awell known global IT solutions provider. Our expert team of HTML 5 Developers has helped the company to complete multiple projects on the HTML 5 platform to clients world-wide. At SynapseIndia, employees are provided with Indoor game facilities like Table tennis so that they can stay motivated at work.